Thank you for your email. I am recurperating day by day and feeling much better healthwise. with false claim towards securing the funds on your behalf. You were never issued this, and as a result the imposters were able to capitalise on taking advantage of you. However, things are being resolved amicably and hopefully we should be able to resolve the whole process so that the funds can finally be able to be released to you. Also you will have to send me your banking co-ordinates where you want the transfer of USD15,5000,000 be initiated into. You can find the attached copy of the response letter from the bank regarding to our formal application. I shall send you other copies of the remaining documents once I have them in my possession. This whole process has cost so much on my path Sir; financially,mentally and physically, but at this time we need to wait for the bank' s final verdict, and hopefully it would fall in our favor as I am being assured by the Attorney i have hired here. Like I advised previously, you need to be prepared financially in regards to what the verdict of the bank would be as advised by the local lawyer here here. Also take note that we need to secure the requested information from the bank in the second letter give. It requires we provide a copy of any of your utility bills in the last six months. 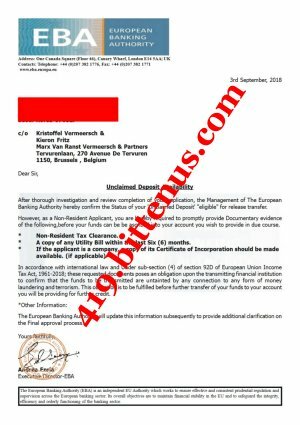 Also we need to secure a tax clearance certificate here in Belgium on your behalf. We do not have the cost , but still on the process to know the cost from the tax officer. As soon as we get the amount, I would let you know so that we can be able to secure it on your behalf. You can see its not an easy task bu a positive one and hopefully we should finalize this ordeal as soon as possible, provided we oblige with the law here. I also want to caution you Sir that ON NO ACCOUNT SHOULD ANY INFORMATION I SHARE WITH YOU BE SHARED TO ANY THIRD PARTY. Based on your past experience and we do not want to further risk after going through all these in trying to resolve this case. Please do acknowledge the receipt of this email. This communication from Kieron Fritz may contain privileged and/or confidential information. It is intended solely for the use of the addressee. If you are not the intended recipient, you are strictly prohibited from disclosing, copying, distributing or using any of this information. If you receive this communication in error please contact the sender immediately and destroy the material in its entirety, whether electronic or hard copy. This communication may contain nonpublic personal information about consumers subject to the restrictions of the Gramm-Leach-Bliley Act. you may not directly or indirectly reuse or re-disclose such information for any purpose other than to provide the services for which you are receiving the information.